In the digital age, it’s critical to recruit tech professionals with the right skill sets. Thanks to one of our partners, Verified First, for sharing their insight with us. Tech talent is in high demand, but short supply. To supply their companies with a steady talent pipeline, recruiters need to attract high-demand candidates. But in today’s market, it takes more than just a paycheck to recruit the best candidates. 1. Consider leveraging freelancers and independent contractors. Freelance work is a convenient way for tech workers to have more control over hours and wages. With national unemployment at a record low, tech workers have more options. This has led many tech professionals to join the gig economy. Today, companies recognize they can’t afford to dismiss independent contractors as a viable talent source. As the labor market tightens, more businesses will tap into the gig economy to fill positions. Don’t overlook using these specialized workers to fill your positions. 2. Advertise what tech candidates want. It takes more than money to recruit the best talent. In today’s market, tech candidates have many employment options. That’s why a savvy recruiter understands how to advertise their employer’s unique value. Instead of just highlighting the pay and benefits, advertise the role and employer brand. Candidates want to understand what their experience will be like at an organization. They want to ensure the job will align with their personal interests and values. If you can successfully articulate this value, it will help you attract the right candidate. 3. Look in nontraditional spaces. Some employers primarily look at elite institutions like Stanford or MIT for their recruiting efforts. This limits not only the diversity of your hires, but also restricts your recruiting pool. Looking in nontraditional spaces create new opportunities. Other institutions, even two-year colleges, have skilled individuals that can fill open positions. It can also be viable to train people with transferable skills. These candidates often have the talent to succeed, but they need access to the right opportunities. Don’t forget to leverage online communities to source candidates. Tools such as Google Hangouts, IT websites, and Githhub can help you gain access to your audience. It’s important to identify where your ideal candidate spends time online. This allows you to position yourself to get in front of the right people. A long application process is a roadblock to talent acquisition. CIO Insight revealed that 63% of IT professionals believe online applications are too long. Additionally, 46% won’t even apply for a job if the application is too long. 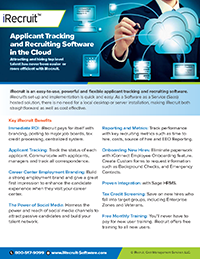 It’s essential for companies to streamline the application process. This can be accomplished through allowing candidates to link their social profile with the application. Making the application mobile enabled also helps improve the conversion rate of applicants. Finally, keep in mind that in the current job market, most candidates are passive. Because they’re not in a rush to find a new job, they may not have the patience for a lengthy application process. Hiring Managers must ensure a lengthy application doesn’t become a stumbling block. In a crowded marketplace, many tech companies can stand out through creating a favorable candidate experience. The candidate experience can be improved at all stages of the hiring process. Savvy organizations are aware of this and take steps to make the experience as enjoyable as possible. Confirm receipt of applications through confirmation emails. Inform candidates promptly when positions are filled. Allowing candidates to speak to current team members and check for cultural fit. Showing your passion for the role and company. When you find the ideal candidate, do you have a fast screening process? In the tech industry, it’s common for the best candidates to receive more than one job offer. If you have a slow vetting process for pre-employment screening, you may fail to acquire top talent. In fact, 40% of organizations have lost a preferred candidate because of a lengthy recruitment process. Through our efficient integration process with iRecruit, we can help you quickly lock down top talent. For more information, click here. This entry was posted in Blog, iRecruit Blog and tagged recruiting, syndicated blog, Talent, Tech Talent, verified first. Bookmark the permalink.